Tammy and I left Wilmington after work on Thursday and headed to The RV Resort at Carolina Crossroads off I-95 near Roanoke Rapids NC. This is about 179 miles from Wilmington and a good 3 hour drive. We traveled to Smithfield NC and stopped at a Walmart for the night being that we weren’t supposed to be at the campground until Friday. If we are traveling over a couple of hours away from home, we like to leave the evening before and break up the trip. We arrived at the Walmart just after dark and found other big trucks and a couple of campers already there. So we found us a spot and shut it down for the evening after we did a little shopping at Walmart. This was a 24 hour store, which has traffic moving around all night but I like the fact that there is movement and the parking lot is lit all night. Helps that the generator dampens the noise. I was up early getting the bugs off the front of the motorhome and checking things out and we were on the road by 8:00am and moved over to Carolina Outlet which is on I-95 at exit 97. We parked there until they opened at 10:00 and did a little shopping for Tammy. about a mile off the interstate behind the Roanoke Rapids Theater, which was opened by Dolly Parton’s brother Randy. The place has a lot of history and has a big “for sale” sign in front. Being that the campground is so close to the interstate, it is very convenient for RV’ers looking for quick overnight only stay while they are traveling north or south. They advertise “express check-in” and $32.00 overnight rate. The site behind us changed occupants every night. I knew when I saw this sign pulling in, I was in trouble. It’s a “no no” in most campgrounds to wash your camper. This is the first one that said it was alright, I have seen a couple that would charge you a fee and one that had an area to wash your RV at. All we had to do was provide the brush and bucket. 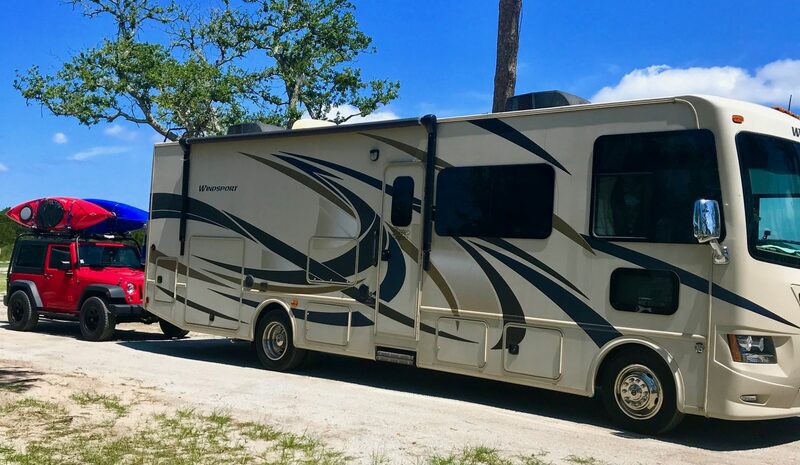 That’s the first thing Tammy wanted to do, was wash the motorhome….which was needed being that the location we store ours in is very dusty and it had been awhile since I was able to wash it. And then on Sunday afternoon she decided we needed to clean the underside of our awning. This was a nice campground, paved pull thru sites with a patio, 50 amp service with ok cable and wi-fi. The bathhouses were on the small side, but clean. Nice pool and hot tub, with a covered area with pool table and other games. They had gazebos located thru out the campground on selected sites and if you were good enough, you could set up where you could step out of the camper onto the gazebo. The campground had a lot of long term campers (there is a big gas line project going on in the area) in the back, however the place is quite at night and the whole holiday weekend we were there. The girls picked this location, being that we hadn’t been there before. There is not much to do in the area (I did pick up another state park) but would be a good place to work out of and I wouldn’t have a problem staying there again. The rate was $42.00 a night and gave a Good Sam discount. We were with Ricky and Tina, Randy and Teresa and had a good weekend resting, eating and having good fellowship. The weather was good, with no rain in our area. On Saturday, we went over to Medco Mountain State Park which was about 20 minutes away in Hollister NC. All to soon it was time to come back home on Monday morning, after being treated with sausage and biscuits for breakfast by Randy and Teresa it was time to say our goodbyes and head back to the port city. Ok, so a lot of RV’ers have a US map displayed somewhere on their RV showing different colors in the states that they have traveled with their RV. Well Tammy has joked that we should get us one. I have told her we didn’t need to get one, that I would be embarrassed being that we have only been in NC and SC with our campers. Well she did get us a cute little pillow that has a US map on it that you can use a permanent marker to show what states you have visited. Well ours now has the state of Virginia on it, we were only 8 miles from the state line and I couldn’t resist going. We made it to the state line and I took the first exit and gassed up at a Pilot Truck Stop before returning to North Carolina. We got back into Wilmington around 3:30pm after an easy trip home stopping at a rest area on I-95 where we took a break and had lunch. Tammy and I are looking forward to when we will be able to hit the road for more then just the weekend seeking fun and sun! Thanks for visiting our site and please stop by again!